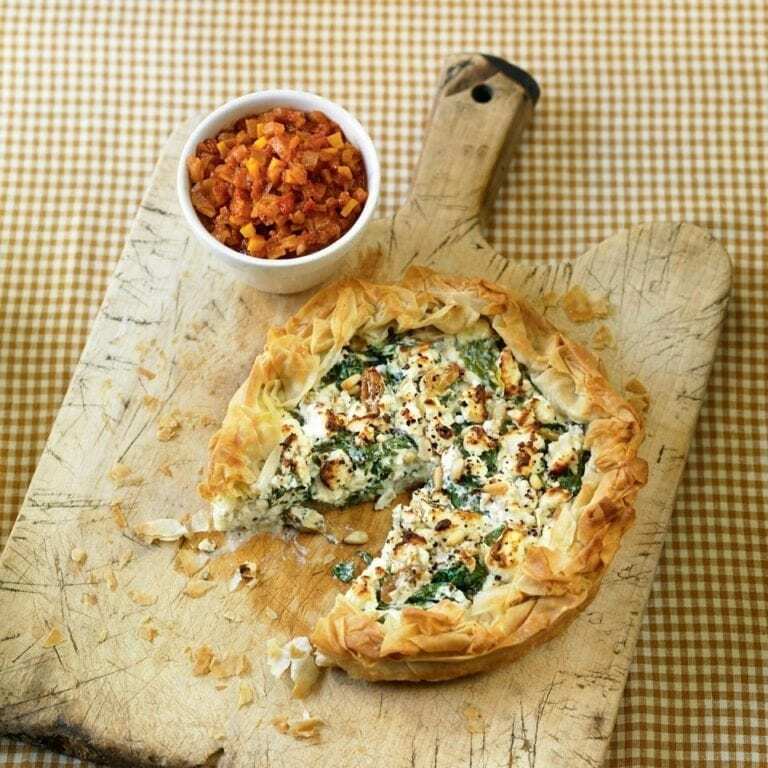 This dish has a gorgeous filling of spinach, cheeses, pine nuts and raisins, an ideal centerpiece to a vegetarian meal. Preheat the oven to 190°C/fan170°C/gas5. Brush a 20cm round loose-bottomed tart tin with some of the butter. Lay a few sheets of filo across it, slightly overlapping. Brush the overhanging filo with more butter. Continue layering with filo, brushing with butter as you go. Set aside. Crumble 125g of the feta into a large bowl and mix with the rest of the filling ingredients. Season with pepper and spoon into the filo case. Crumble over the remaining feta. Fold the overhanging filo over the filling, then give it a bit of a scrunch to form an edge. Bake for 18-20 minutes or until the filo is golden and crisp and the filling piping hot. Meanwhile, make the relish. Heat the oil in a large frying pan over a medium heat. Add the onion, carrot and garlic and cook, stirring, for 5 minutes. Stir in the purée, then add the cinnamon and tomatoes and cook for 2-3 minutes. Add the stock and simmer for 8-10 minutes, until reduced slightly. Season to taste. Serve the filo tart with the relish.